Update the plugins. The theme required and recommended plugins are included in the theme package inside the ../Newspaper-tf/plugins folder. Please read the plugin update guide. After downloading the files, you must decide if you want to install the update via FTP, via WordPress or update automatically via Envato WordPress Toolkit. For directions on all methods, please continue reading below. Step 1 – Deactivate the current “Newspaper” theme from the Appearance > Themes section by simply activating a different theme. Once you activate a different theme, delete the Newspaper theme. Don’t worry, your content will not be lost. Step 2 – Get the “Newspaper.zip” file from your new Themeforest download (Installable WordPress file only). If you downloaded the “All Files & Documentation” from Themeforest, then you need to unzip the archive file you received, the Newspaper.zip will be inside it. 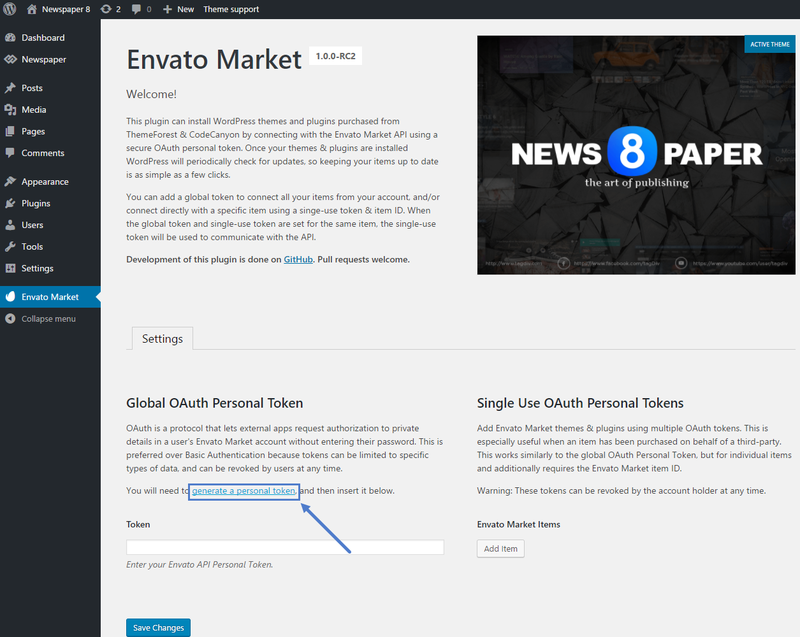 Step 3 – Go to Appearance > Themes, choose Add New Theme, Upload the “Newspaper.zip” and click on the “Install Now” button. Step 4 – After your upload is finished choose Activate the theme. Step 5 – Update the plugins. If you want to know how to update the Newspaper Theme via FTP, you need to first place your website in maintenance mode. Use a plugin to do this, for example, Ultimate Maintenance Mode, WP Maintenance Mode, and many others. Step 1 – Open the folder “Themes” located in “Your Site’s Name/Wp-Content/Themes” and backup your Newspaper Theme folder by saving it somewhere on your computer. You can also choose to delete it. Your content won’t be lost, but please note that if you have any theme code modifications, they will be lost. You have to reapply them after the update is over. Step 2 – Connect your FTP account using Filezilla. Navigate to the WordPress theme directory within Filezilla (“Your Site’s Name/Wp-Content/Themes”). Step 3 – Download the newest version of the Newspaper Theme from ThemeForest. Step 4 – Unzip the “Newspaper-tf” archive file and the “Newspaper.zip” file. Step 5 – Extract “Newspaper.zip” file. Step 7 – Drag and drop the new “Newspaper Theme” folder into “Your Site’s Name/Wp-Content/Themes”. Your content will not get removed! Update all of your plugins, for more information regarding this visit this link. 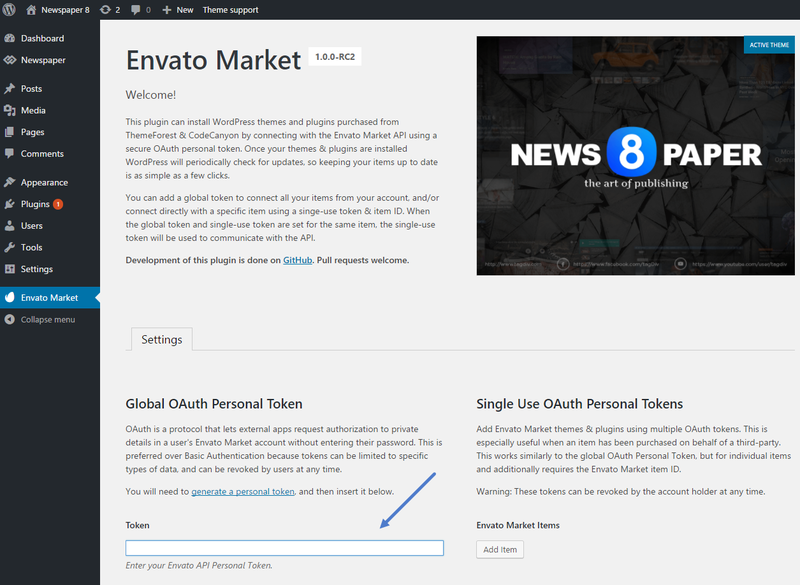 As the old Envato Toolkit has become deprecated, it was replaced with a new plugin called Envato Market. Follow these steps to automatically update your theme. Step 2 – Upload and activate the Envato WordPress plugin (.zip file that you downloaded). Step 3 – Create your personal Token – To create a token, access the provided link on the plugin settings page and follow the on-screen instructions. Step 4 – Insert your Envato token key (not the token name) in the designated field. Step 5 – Add a new item – Add your theme to the list of purchased items. 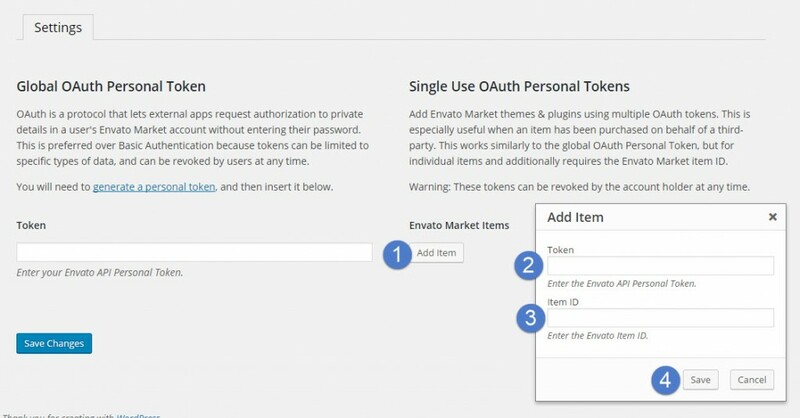 You will need the personal token again and the Envato item ID number. These are 5489609 for Newspaper and 9512331 for Newsmag. If everything is properly set up to this point and you save your changes, a new tab called themes will appear in the plugin settings. 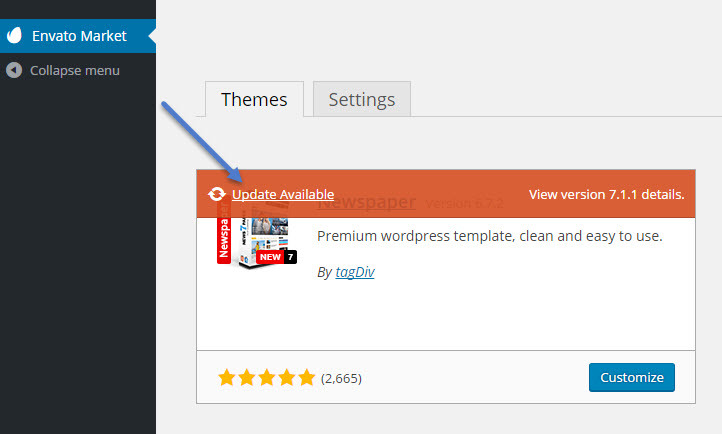 Step 6 – Update your theme – Press the update theme button and wait for the update to finish. Step 7 – Update the plugins. 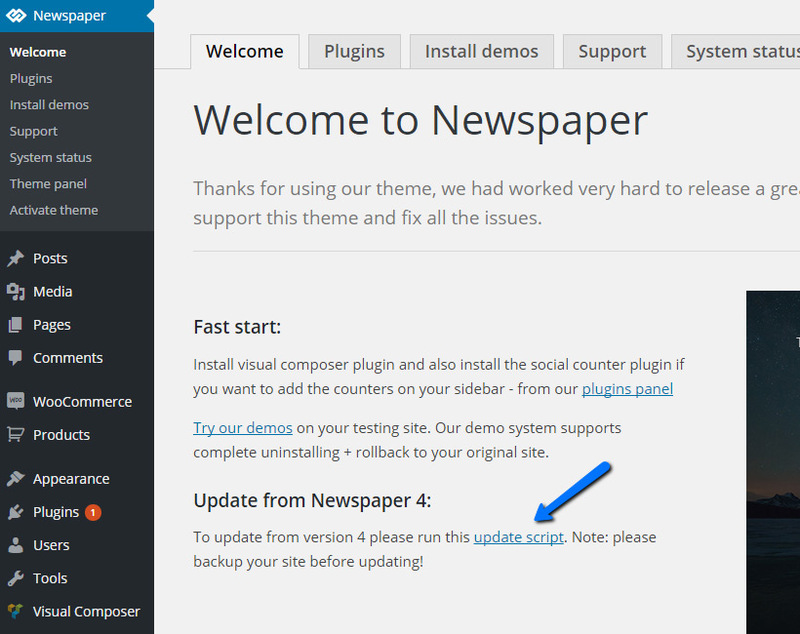 Updating from Newspaper 4: Please run the import script if you want to update from an older version of newspaper but only after you backed up your settings. After running the import script it may be impossible to roll back to the older version of the theme without a backup of the database!